What are Bryozoans? Bryozoans are also known as “moss animals” for their superficial resemblance to mosses. What we see as “a bryozoan” is really a colony made of many little units, each made up of the animal and its house. Bryozoans are closely related to the brachiopods. Both groups possess a unique feeding and respiratory organ called a lophophore, which looks a bit like a rubber band covered with tiny hairs. By moving the hairs, they generate a current that brings water and food particles to the animal. Most bryozoans live attached to a hard surface, such as mussels, rocks, wood, sea turtle shells, or large algae. Many Paleozoic bryozoans built strong colony skeletons of calcium carbonate and are common fossils. 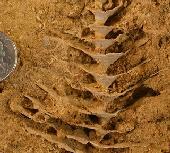 First known fossil occurrence: Ordovician.